Book Group to begin Wednesday, March 7, 12-1 pm at the Center for Mindfulness Insight Meditation in Wenham. Weekly, drop in, reading and sharing format, bag lunch option. All welcome! Description: Awakening Joy is more than just another book about happiness. More than simply offering suggested strategies to change our behavior, it uses time-tested practices to train the mind to learn new ways of thinking. The principles of the course are universal, although much of the material includes Buddhist philosophy drawn from the author’s thirty years as a Buddhist meditation teacher and spiritual counselor. In these times of economic uncertainty Awakening Joy shows we can get through hard times and use our experience to keep the our heart open while moving from discouragement to well-being, regardless of the external circumstances. Genuine well-being is not expensive. True happiness is not about acquiring anything, but rather about opening to the natural joy and aliveness right inside you. • cultivate effective practices for sustaining joyfulness, such as reclaiming your natural sense of wonder and finding joy in the midst of everyday experiences. 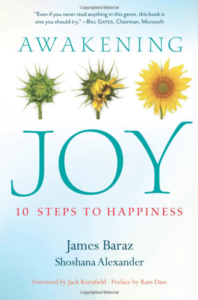 Each chapter of Awakening Joy consists of one of the steps in Baraz’s ten-step program and includes engaging exercises and practical advice to make happiness your natural default setting. For everyone from the cynic who is despondent over life’s many sorrows, to the harried commuter raging at freeway traffic, this book offers up a simple yet powerful message of hope grounded in the realization that joy already exists inside every one of us. Like a precious child, it only needs to be recognized, embraced, and nurtured in order to grow to its full potential. The weekly Way of Liberation Study Group will begin Saturday, March 3, 11-12pm at the Center for Mindfulness Insight Meditation in Wenham. Immediately following morning meditation and talk. 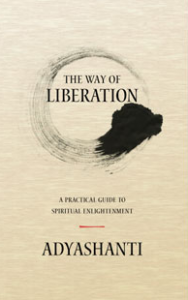 Book: The Way of Liberation: A Practical Guide to Spiritual Enlightenment by Adyashanti, a 53-page book may be purchased or downloaded online for free at Adyashanti.org. This study course guides you through an in-depth, transformational inquiry based on Adyashanti’s foundational book The Way of Liberation. It offers a series of recorded talks and dialogues (the 9 audio CD set has been purchased and will be available for our use), weekly readings, and written Q&A between Adyashanti and the original course participants. Learn how to work with The Way of Liberation teachings as an integrated whole. Tap into the power that underlies your unique process of transformation, guided by Adyashanti insight and experience. Uncover the often overlooked aspects of spiritual life that can keep you stuck psychologically and spiritually. Become grounded in the essential foundations that support you to not only realize your true nature, but also to live it. Understand and experience the core practices that have the greatest impact on your unfolding realization. Avoid aimless practices and fleeting realizations by seeing the larger context of your process of awakening and liberation. Experience how deep and powerful it can be when you engage with inquiry and meditation correctly, within a clear context of understanding. For more information contact the group facilitator: Peggy Stedman at: pegstedman@yahoo.com.